windows mobile 6 standard news and reviews for Windows Mobile Pocket PC, Palm, Microsoft Smartphones and Symbian cell phones. Mobile Tech Review has recently posted nice review of the Samsung Blackjack II. This is a smartphone equipped with Windows Mobile 6 Standard, HSDPA radio, 2MP camera, larger screen, GPS, and a improved upon QWERTY keyboard. Samsung i600 smartphone which is a European version of Samsung BlackJack, but with WiFi, has just received Windows Mobile 6 upgrade. To learn more or to download the Windows Mobile 6 ROM upgrade for your Samsung i600, click here. Motorola is about to release new Windows Mobile based Smartphone for the mass-market. It is called Motorola Genghis and is smartphone with QWERTY keyboard and will be powered by Windows Mobile 6 Standard. Motorola says that Genghis is not directly made for the businessman but more for those who appreciate the advantages of a business device without too much hustle and bustle. The Motorolsa Genghis will be placed in the entry level of the market with a nice price tag. Motorola Genghis will have more fashionable design and will be offered in more than one color. Be aware there is no 100% confirmation that Motorola Genghis in fact runs Windows Mobile operating system be i hope so, so stay in touch for further news. After the launch of HTC TyTN II the taiwanesse company is about to release new flagship, but this time it will work on Windows Mobile 6 Standard platform. HTC S730 will be the successor to the rather excellent HTC S710 smartphone. The S730 aka Wings has a rapid 400 Mhz Qualcomm CPU, 3G, face-pointing camera, 64Mb RAM and 256Mb ROM plus a redesigned numeric keypad. It is about to be announced today officialy today but here i have some photos found on Superior Gadgets News. You can find specifications for HTC S730 here (they are short yet but we will update it when it is officialy released). I just found a very interesting article on The Boy Genius which topic is another soon-to-be-announced HTC device codenamed HTC Juno. As it goes clear from the information available it will has 3G connectivity, a 2 megapixel camera and Windows Mobile 6 Standard (Smartphone), along with the TouchFLO technology. T-Mobz should be positioning this phone as an "adult Sidekick" and the phone has a "wow screen and interface." said from BGR. HTC Juno will be available from T-Mobile USA exclusive and is set for a mid to late October release. Palm Europe Ltd today announced the Palm Treo 500v smartphone which combines multiple forms of communication and multimedia capabilities with high speed 3G/UMTS mobile internet access, allowing users access to popular websites such as MySpace, YouTube and eBay whilst on the move. The Palm Treo 500v smartphone runs on a Windows Mobile 6 Standard platform and has a full QWERTY keyboard, QVGA screen and supports triband GSM/GPRS with 900/1800/199 MHz and singleband UMTS with 2100 MHz (no HSDPA). Furthermore it supports Bluetooth 2.0+EDR; however it's not including WiFi. The 150 MB ROM can be extended by microSD cards (up to 2 GB) but the microSD card isn't hot-swappable since it's located under the battery. John Hartnett, Senior Vice President, Global Markets and Windows Business Unit, Palm Inc, said, "We are pleased to be one of the first partners to provide an internet ready Vodafone live! smartphone. The Treo 500v is priced to enable a broader audience to experience the internet and E-Mail on the go. Today's generation has really embraced the internet as a way of keeping in touch with friends and family, seeking out entertainment and managing their day to day lives. We can offer users the choice to do what they want, how they want, when they want." "The new Treo 500v adds a third internet ready Vodafone live! and Microsoft Windows Mobile device to our recently announced Global Handset range," said Jens Schulte-Bockum, Global Terminals Director, Vodafone Group. "When combined with our high-speed 3G/UMTS network and fast access to the internet, along with great browsing and messaging support, we are confident the Palm Treo 500v will appeal to the growing group of consumers looking for the same functionality and ease of use our business customers continue to enjoy from this type of premium device." With the Palm Treo 500v smartphone customers can also manage documents using mobile versions of familiar Microsoft applications like Outlook, Office, and Windows Live for Windows Mobile. In addition users can share the Treo 500v smartphone's data access with a laptop, so they can stay connected anywhere within wireless coverage. "With the launch of the Treo 500v smartphone, Palm is delivering the benefits of Windows Mobile 6 to an increasingly broad range of users across Europe, providing them with access to important information and personal applications, such as Windows Live, to help them manage work and life on the move," said Tony Mestres, General Manager, Microsoft Mobile Communications Business. "This latest phone is another example of our joint commitment to extend the range and choice of Windows Mobile phones on the market for users." The Treo 500v will initially be and exclusively to Vodafone customers in Germany, Ireland, Italy, Netherlands, Portugal, Spain, the UK and Vodacom customers in South Africa. The Vodafone exclusivity ends end of this year and and Palm confirmed that it cannot be expected in other countries before January 2008 as the Treo 500. Available from October 1st in white only, neither Palm nor Vodafone have given a price yet but with a contract it can be expected to be available for less then 99 Euro! And along with the WM6 upgrade for HTC X7500 Advantage, HTC releases another promised Windows Mobile 6 ROM upgrade for the HTC S620 aka HTC Excalibur. As it looks like from the upgrade HTC has started to roll-out Yahoo! Go, as announced earlier this year. This is information get from a teaser on HTC's front-page which mentions that Yahoo! Go is part of the new S620 Windows Mobile 6 ROM. As always, you have to be a registered user of HTC's e-Club and you have to have added your serial number to your e-Club account to get access to the download. The only disappointment of this upgrade is the lack of Office Mobile and using ClearVue instead. But even without Office Mobile, Windows Mobile 6 is worth a (free) upgrade. Please keep in mind that this ROM upgrade is for HTC branded devices only. If you have another branded device (like from Orange, T-Mobile Europe (the U.S. version is available for a long time already) or O2) please ask your operator for an upgrade. Download the ROM upgrade here. The default calculator application in today smartphones is quite cool but when it comes to hard calculations it gives up. Here is one just relesed program for Windows Mobile 6 Standard based Smartphones which is a free calculator. It is called SmartCalc and is a perfect substitute calculator for the smartphone, because the one that comes with it is lacking a few features. SmartCalc has advanced functions like square root, sin, cosine and many other. It includes a memory funtion, and will actually exit the application instead of hanging around in the background. 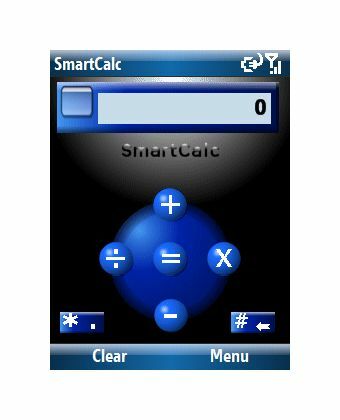 SmartCalc is available for free download at Smartphone Freeware site, and ofcourse you can browse for other calculators here which will best fit your needs. Samsung has shown the face of their latest Windows Mobile powered Smartphone, the Samsung SGH-i620. It is not available yet but some carriers hinted its existence already. And as it looks like it follows the SGH-i600 philosophy with one addition, it slides. Samsung SGH-i620 has already been found under the T-Mobiles Downloads section. This Slider Smartphone comes with QWERTY keyboard, two cameras which permit the conclusion on HSDPA and UMTS, Windows Mobile 6 Standard and very probably a Samsung processor. At the moment i am aware of two version of this smartphone and they are SGH-i620 and SGH-i620V (V is for the Vodafone version) according to the Global Certification Forum. Asus launched the ASUS M530w Smartphone! If you read us regulary you would remeber is have talked you of AsusTek plans to release a UMTS Windows Mobile 6 Smartphone with Keyboard. Now it has become true and the new smartphoen has QWERTY keyboard for single-handed usage and 3G support, but lacks HSDPA, which is a bit dissapointing. Otherwise it is packed with innovative features, which allows users to send and receive messages instantly anywhere – providing vital information for users to make important and informed business decisions. The ASUS M530w supports Push E-mail and can simultaneously receive mails from the user's office Outlook mail server. It can also update their organizers and communications records for easier data management. These important features will ensure that users will never miss any important information and be able to quickly reply to work requirements – enhancing their work productivity even if they are not in the office, or caught in a meeting. Another useful mail function of the ASUS M530w is its support for various Mail Server systems (POP3, IMAP4, Microsoft Exchange, BlackBerry4.0). Even if the user goes abroad, different mail servers will not hinder them from being connected and updated with work mails - allowing them to work more efficiently. Additionally, the QWERTY keypad is identical to the computer keyboard counterpart – allowing users who are more accustomed to English to conveniently type in their messages for smoother communications. The ASUS M530w is equipped with high-speed transfer capabilities to provide users with a host of multimedia benefits. With the 3G Video Phone, users can talk to anyone face to face, and 3G broadband makes downloading music, MV and other video and music programs a breeze. It is also able to utilize wireless connections via 802.11 b/g for high speed data transfers for total mobility. In addition, built-in Bluetooth technology seamlessly interfaces with other Bluetooth devices and provides freedom of movement without the hassle of wires. The built-in Business Card Recognition feature allows users to use the ASUS M530w’s 2.0 Mega Pixel Auto-Macro camera to capture the details of a business card and avoid tediously keying in the data into the contacts book. With the integrated Windows Mobile 6 Standard operating system´s ActiveSync, users can easily transfer data from the phone to a server. In the event that the phone is lost, users will still be able to retain the account number and transfer stored data into another phone – saving the hassle of reinstalling or re-keying in data. The M530w’s built-in ClearVue document viewer can read Word, Excel, PowerPoint and PDF documents - transforming the phone into an individual mobile office. The ASUS M530’s built-in Windows Live Messenger gives users the opportunity to sign in anywhere, anytime providing easy chat options to users wherever they are. The integrated 2.0 Mega Pixel Auto-Macro camera is equipped with a powerful flash and strong close-up shot ability for the capturing of vivid photos for life´s memorable moments. Furthermore, the Windows Media Player application can support full screen movies and music broadcasts, and the two built-in brain teaser games allows users to exercise their brain cells through nifty gameplay. As it looks like Asus M530W will be one serious competitor to Samsung i600 and Motorola Q. You can take a look ot its specifications here. • HTC Touch HD to Become T-Mobile G2?